I need inspiration! It is grey out. Granted, it is 7AM on a January Saturday morning, it is allowed to be grey, but I just want to growl. Not a, “Who’s at the door?” growl or, “That’s MY food dish” growl, just one of those low in the throat, grumpy growls that, when someone else hears it, they know EXACTLY how you feel. Grey, grumpy, GROWLY. 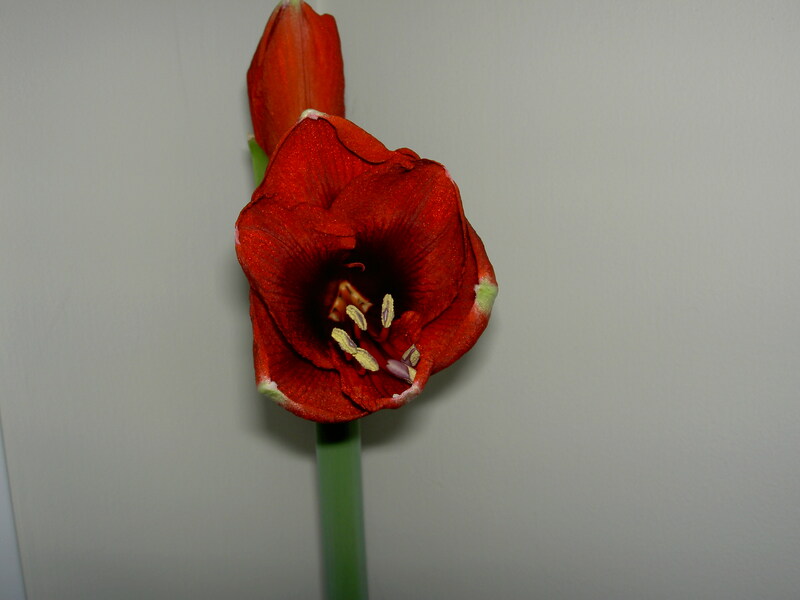 I bought this Amaryllis on sale after Christmas. $5. 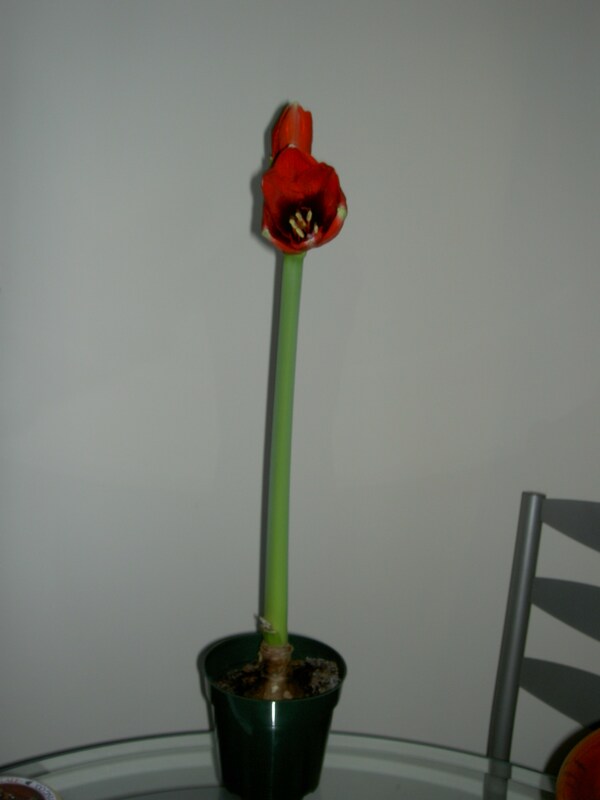 It has no leaves, just a funny, phallic 23 inch-tall stem with buds at the top that just started to open. This pretty flower blooming in front of a window that only shows grey beyond it will have to be my inspiration to trudge through what I think it the most annoying part of the gardening life cycle – starting seeds. I’d rather weed. You would think that the miracle of adding water to a little speck and ending up with a tomato or a zucchini or, yum, Husk Cherries (more on those later!) would awe and excite me. NOPE. Hate it. If every speck became a plant, I’d love it, but the stress of seeing the pan of dirt STAY a pan of dirt without so much as, “Nope, Jenn, no plants here, move along” really makes me irritated. I am impatient. I know this about myself, my loved ones definitely know this about me. A trait gardeners need to have is patience. You can’t rush an heirloom tomato that matures in 70-80 days or else you’re eating it green. Patience is a virtue, blah blah blah. Whatever. 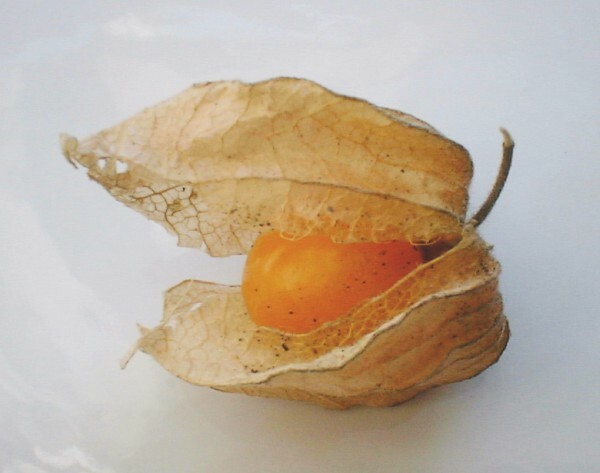 Husk Cherries (physalis), also named Ground Cherries, Cape Gooseberries, Husk Tomatoes, and Pineapple Tomatillos are a supreme test of my patience. We discovered these little babies when we joined a CSA 2 Summers ago. It run by a young couple who were leasing the land from an organic farmer. We signed up for 1/2 share, suggested for a family of 2 non-vegetarians. Every Friday, either Keith or I would pick up our veggies in the shed at the CSA (Community Supported Agrigulture.) There would be a sign saying what our share was for the week like, 2 pounds tomatoes, 2 bunches Kale, 1 bunch Swiss Chard, 2 cucumbers, etc. I could also pick flowers, herbs and, when indicated on a sign in the shed, head down into the gardens for the PYO. Sometimes PYO (pick-your-own) consisted of green beans, cherry tomatoes, or arugula. One day, while picking greenbeans and doing some weeding of the bed (encouraged if you were a “GOOD” CSA member, which I surely wanted to be! ), the husband of the couple who ran the CSA was a few garden beds past me and said, “Ooh, the Husk Cherries are starting to ripen! Love these.” I asked him what he was talking about and he picked one for me. He told me to take the husk off (no -brainer, didn’t look edible) and just eat it. I am not a huge fan of eating tomatoes off the vine. I like tomatoes, don’t get me wrong. Put them with something else like mozzarella and proscuitto and some olive oil, I am all about the tomato, but eating off the vine not so much. It was yellowish-tan. It looked sour. I put it in my mouth with major trepidation, internally cringing at the thought that when I bit down, this little berry or whatever it was, was going to burst ickiness and sourness in my mouth. Shudder. I love good surprises. It was so good. The flavor was a combination of sweet cream butter, strawberry and tomato. Or maybe pineapple, strawberry and tomato. I brought as many home as I could pick. Keith loved them too. Put them in an Arugula salad with toasted pine nuts and fresh goat cheese and you’re in for a treat. For the rest of the season, every Friday, I picked as many as I could to bring home. We shared with friends and co-workers – apparently, we weren’t the only ones who had never heard these little guys. 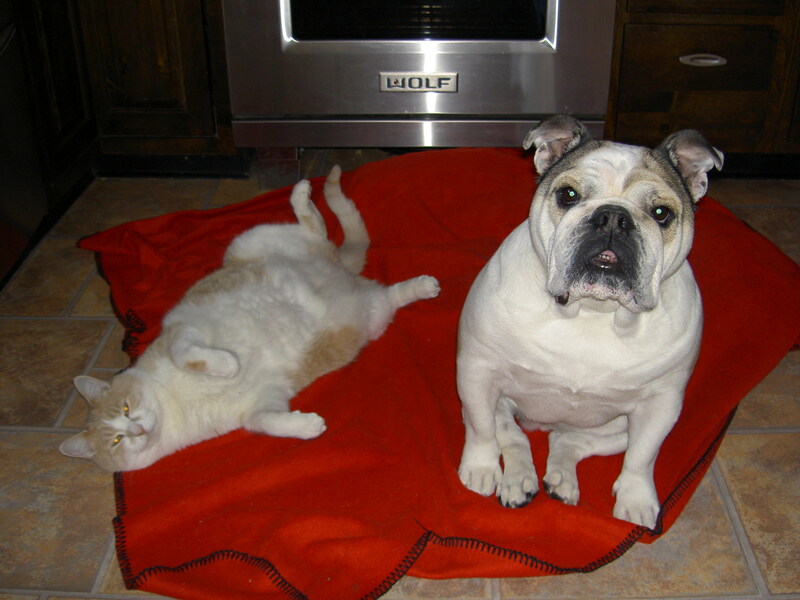 It has been a while since I added a picture to this post, so here is one of Daisy and Peber at their best. Now, if you’re judging me for having only 1/2 share in the CSA and picking as many ripe Husk Cherries as I could find every week, hear me out. I have a perfectly good explanation for hoarding the Husk Cherries (ooh, there is that word again, perhaps I do have a problem.) This was only the CSA’s second year. This was our first ever with a CSA, but I had done some research online. It seemed that our choice, although close to home, didn’t have as many varieties of veggies as other places did. We ended up calling it the “Kale Cult.” Every week, the share offered Kale. Big bunches of Kale. I tried every which way to cook the stuff. Sauteed and smothered in butter, wilted with garlic and butter, steamed with parmesan cheese, in chicken noodle soup, you name it, we tried it. We did not like it. We ended up leaving bunches of Kale on the table every week. There was so much Kale and Swiss Chard (also inedible we think) that we sort of felt that it was ok to take extra Husk Cherries if we were leaving our share of the bitter greens behind for someone else to take. Give and take, you know? We decided not to join the Kale Cult last Summer and decided to grow our own – grow things we liked. Keith thinks this was the beginning of our “Fend for Ourselves” dream. Keith found Husk Cherry seeds online last Winter and bought a packet. They took FOREVER to germinate under grow lights in the basement. Sheesh. When they went outside in the Side Garden (calling it Peber’s Point is starting to grow in me. Nice job, Will C! The board of directors for The Daisy Patch will vote this weekend on the new name) they were very small. Miniscule, like a 2-inch stem with 2 leaves on top. Then, in the ground, they took MORE FOREVER to do something, like, uh, grow. We did get many Husk Cherries off the three plants eventually (enough for Keith to include some in jam he made), but I wish the growing season were longer because, no matter how much I covered them, we lost a lot to the first freeze. Waah! Patience will be my new mantra. We just ordered the seeds along with several varieties of tomatoes, lettuce and potatoes and we’ll plant them in the basement under the grow lights, next to Keith’s hot peppers just as soon as they arrive. I just wish they’d hurry up.